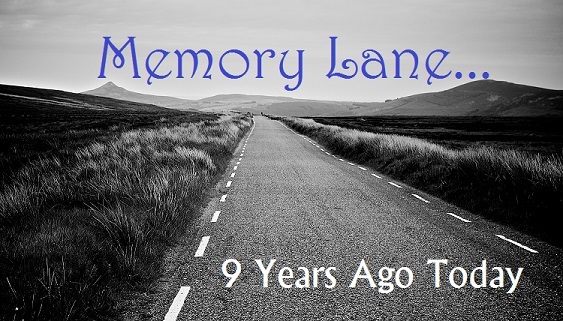 Memory Lane… 9 Years Ago Today! year, especially at the end of the year. I was working at a fairly new job and started going to New Life Church (NLC). As I got more involved at NLC, I was asked to serve as a leader in the single’s ministry. Then at some point after the middle of the year, I began to experience major pain in my left shoulder. I finally went to the doctor in August and he could not find anything wrong, so he sent me to an orthopedic surgeon. Guess what? He couldn’t find anything either! So he sent me to a neck and back specialist. After more test s and scans, he found plenty of things wrong with my neck and spine. I was told that I had the neck of a 45-50 year old man at the age of 33. However, he could find nothing that would cause the pain in my shoulder. So off to another specialist I went to endure more test s. Literally after months of doctor visits and multiply test and scans, my last MRI revealed that I had a torn rotator cuff due to a water skiing accident I had back in the middle of the summer. Soon after all of this happened is when my family found out that my grandpa Ricker was diagnosed with stage 4 lung cancer and was told he would not live more than 6-9 months. All of this was going on while I just started a Masters of Leadership degree. To say the least , I had become very overwhelmed with life as 2006 was coming to a close. I had to get away from the reality of my life and that is exactly what I did! So it was 9 years ago today, on December 15, 2006, that I borrowed my dad’s truck, loaded my four-wheeler in it and head to deer camp in south Arkansas. You might be asking yourself: “Jacob, with all the things that happened in 2006, how do you remember the exact date you went to deer camp for the weekend?” Well, that’s simple. That is day that would forever change my life! How so? After I arrived at deer camp and I unloaded everything, I drove into Arkadelphia for dinner. But not just any dinner. I pulled into Ta Molly’s Mexican Kitchen to have my first date with a very beautiful, sweet, kind, generous and brilliant young woman named Holly. We talked and laughed, well I talked and she laughed until they closed the restaurant. We had a great time that night. Little did I know, that on that night 9 years ago, Holly would become the future Mrs. Jacob Ricker. Since that night God has moved in more than one way! He worked out so much of those things that were weighing me down in 2006 and turned them into blessings beyond anything I could think or imagine (Romans 8:28 & Ephesians 3:20). In January of 2007 I had surgery to repair my rotator cuff and it has since healed. Due to the surgery, I was off of work for roughly three-months. It was during these months that I got spend a lot of time falling in love with Holly. The Lord blessed my family by enabling us to spend another seven years with my grandfather before he passed away in 2013. We are thankful and blessed for each day we had with grandpa. Since the days of serving at NLC, God has called me to be shepherd a church. God has been so good to me! Holly and I got married the next year. I gained Peyton as my son. Holly and I have two beautiful daughters. I have a wonderful and loving family. What a blessing the past nine years have been. Amazing me how the spark of one memory can bring a flood storm of memories into your mind and it causes you to realize just how much God is in control! How He can turn the bad and negative things in life around for your good and for your blessing! However, that does not only apply to those who have hard and difficult times in their past, that goes for those of you who are going through hard and difficult times right now. God can work in your mess! I want to encourage you to look to God and allow Him access to your heart! Allow Him to move in His way and in His timing. He can turn your past into something that you can use to bring Him praise and glory! The question is will you allow Him to make your mess into a masterpiece? I would love to hear how God has moved in your life! How has God turned your mess into something that is praise worthy?